On Thursday, April 4, we were visited by Andrew Cunningham, Jivesh Tolani, Velin Dimitrov and Prof. Taskin Padir (left to right in the photo) from Worcester Polytechnic Institute (WPI). 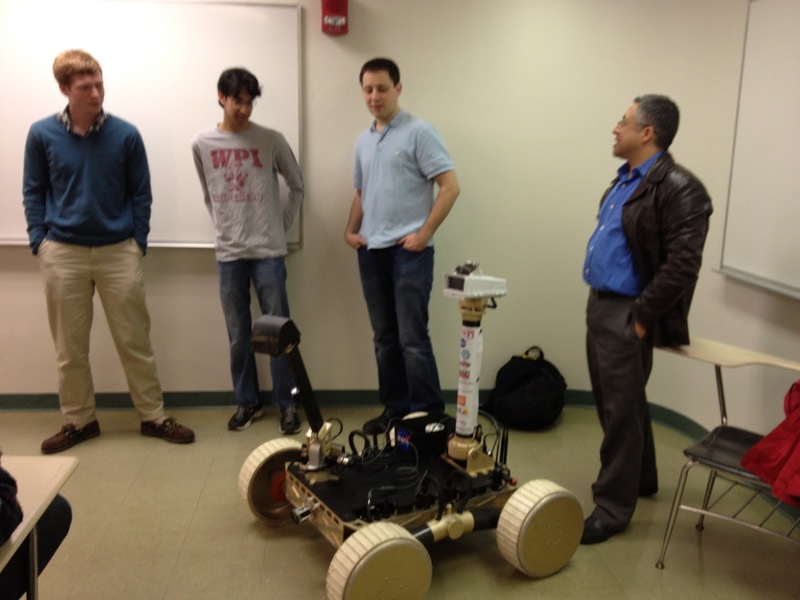 They brought their robot, Oryx 2.0, which won the 2012 RASC-AL RoboOps Competition. They are planning to use the same robot in this year's competition, with the addition of a micro rover that will go out to search for rocks. We really enjoyed their visit, during which they showed us many photos and videos of the competition as well as described the design of their robot. It was especially helpful to be able to ask questions about the competition. While the rules give us some idea of what to expect, there's nothing like hearing about first-hand experience from an experienced team. Andrew, Jivesh, Velin and Taskin: Thanks for coming to visit us!